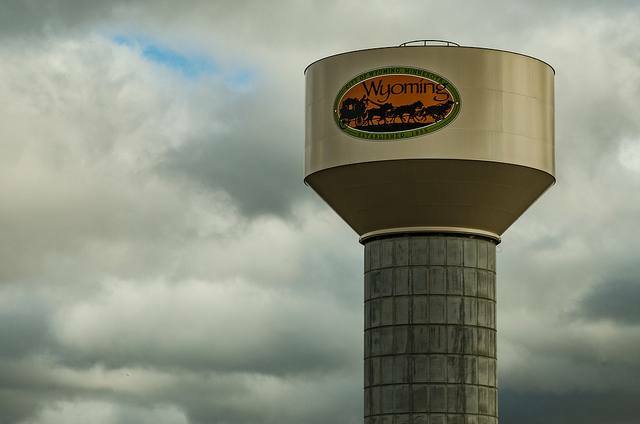 People in Wyoming, Minnesota, gathered together on September 12th to bend the ear of officials from the state’s Public Utilities Commission (PUC). Ann Treacy from the Blandin Foundation attended the meeting and recorded most of the conversation from the 100 or so frustrated and fed-up folks. The meeting was one of five organized by the PUC after a record number of complaints by incumbent telephone and Internet access provider Frontier. It’s safe to say that “frustration” was the star of the night, as everyone who spoke mentioned how it had consumed their experience with Internet access from Frontier. People who spoke at the meeting included those who worked from home, business owners, parents with families whose kids needed Internet access for homework, and retired folks who just wanted to enjoy a quiet evening streaming a movie. Most of the people who spoke at the meeting said that they needed to run mobile hotspots or had given up on Frontier’s DSL service and now rely solely on hot spots to avoid the frustration of dealing with terrible service. Several people at the meeting don’t have the option of mobile hotspots because there’s no cell coverage where they live. In addition to horribly unreliable connectivity, where the only consistency is dropped service, people expressed anger about overpaying for Internet access that was down far too often — even for weeks at a time. When they were able to get online, many people who spoke at the meeting reports horrifically slow speeds and feel they are being “ripped off” because they never reach the “up to” speed that they pay for each month. Once woman has documented her line’s performance and the fastest download speed she has reached is .96 Megabits per second (Mbps); the slowest is .05 Mbps. This same person has had limited success in cajoling Frontier to temporarily lower her bill since 2012. 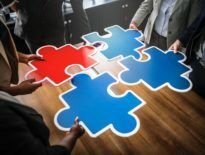 People at the meeting reported confusing and frustrating experiences between customer service representatives and technicians who visited their homes for service calls. Technicians told subscribers to ignore customer service reps and vice versa. Technicians never showed up for scheduled service and people were especially annoyed that they had to pay $80 – $90 for service calls. Subscribers endured long wait-times on hold only to be hung up on and were refused when they wanted to talk to managers. Customer service reps even shamed subscribers when they called to report outages by suggesting they waited too long to call. One gentleman said that, if he’d known dealing with Frontier and its terrible service was so difficult, he would never have moved to Wyoming from the Minneapolis suburbs. Speaker after speaker pointed out that they recognize the root of the problem is lack of competition. In addition to their description of specific issues, almost every attendee expressed a desire to give their business to some other company but they had no other option for Internet access provider — none. Folks in Wyoming feel they’ve been mistreated because Frontier doesn’t have to worry about losing their business. The people in Wyoming are right and Frontier isn’t the only company with the same attitude. Big cable and telecom companies have divided up America’s geography in to slices of monopoly pie, creating an environment in which subscribers can be neglected or even abused. 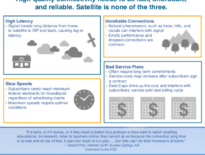 With no other option for Internet access and our dependence on connectivity, subscribers face a tough choice between paying for horrible Internet access or having no connection at all. Read more about Frontier and similar de facto monopolies in our 2018 report, Profiles of Monopoly: Big Cable and Telecom. September 26, 2018 2:00p.m and 6:00p.m. 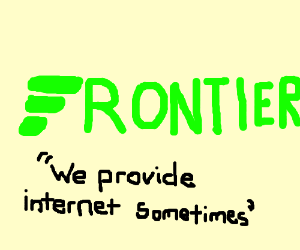 The “new Frontier logo” is by Hatchette, via Drawception. Photo of Wyoming, Minn. water tower via Flickr.